Murder isn’t far down the road as the play begins in an old country house haunted by a vengeful ghost. Local rumors provide tension about mysterious murders nearby the area. Can you guess which character will be the first to disappear? The stage manager is Kris Bushman who has set up a perfect stage for murder. Scenery and lights are headed by Grady McEvoy, and costume design is by Corey Ewan. Assistant costume designer is Annie Morey, and makeup is perfected by Victoria Morgas. 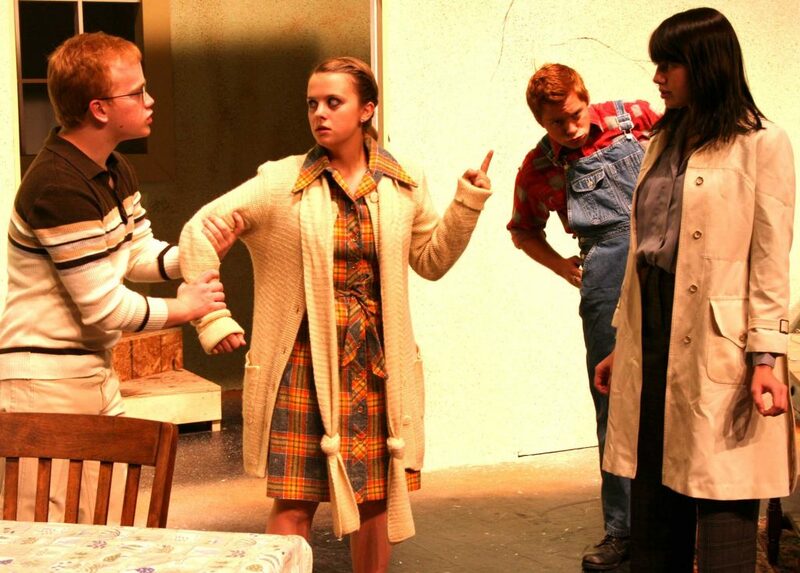 Freshman Miranda Cox portrays Jan Sanderson, a young wife who is recovering from a nervous disorder. She has recently been released from the hospital after a mental breakdown. Will she be able to keep it together when strange voices begin to call to her in the night? Sophmore Timothy Swensen is Jan’s husband Greg Sanderson who recently graduated in archeology. He rents the cabin so Jan can recover, but also to try and save their failing marriage. Will he be able to handle Jan’s failing sanity, or will his sister succeed in pulling them apart? “It is a show filled with scares, mysteries and surprises,” Swensen declared. Freshman Brynne Hunt is Laura Sanderson, the husband’s interfering sister. Manipulative and lustful, she is very close to her brother, driving another wedge between the deteriorating marriage. What is the real reason she accepted the invitation to come to the cabin? Tickets are $10 for adults, $7 for senior citizens, $5 for non-USU students and faculty, and $2 for USU students with current ID cards. Pay for the whole seat, but you’ll only need the edge!